As you know, me:now is the world’s first time-based marketing platform, and we’ve partnered with Veteran Owned UK to offer our premium service for free to ex-servicemen and women across the country. Ex-military personnel with their own small business who are members of the Veteran Owned directory will now receive a free six-month subscription to our premium service. The premium tier usually costs £35pcm. The me:now app allows small businesses to advertise not just what they do, but *when* they’re free. That means they can reach new and existing customers who want their service, in the location they operate in, who want them at a particular time. 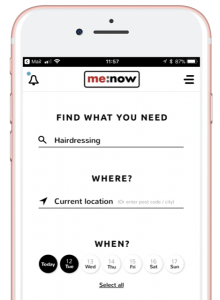 me:now users can search for service providers (plumbers, hair salons, dog groomers, etc…) based on when they have availability, and we’re the first company in the world to offer time-based search across multiple industries. me:now‘s co-founder and CEO Barry Thompson served in the Royal Air Force, and believes there is a huge untapped potential in the veteran workforce, and wants to help ex-servicemen and women become more successful. Veteran Owned UK was set up by Scott Johnson, a former British Army Royal Engineer, to help support ex-military business owners by providing a directory of their services. It is now the largest of its kind in the UK. It was only natural for the two to work together. Business owners who didn’t serve can still sign up for the free tier which provides five adverts a month, or the premium tier, which provides 30 adverts per month. The service was built to be used by anyone, on any device, however we also offer a managed service that can handle the entire process for business owners.